"I congratulate you in having articulated in this and other writings so many aspects of the JFK assassination precisely correctly." "[Green has] a rare ability to bring together numerous important disciplines (history, philosophy, religion, science, journalism, film) and use them all to offer succinct essays that get to the heart of major issues. He focuses on a few key, salient topics and explore them with acerbic wit and sharp political acumen." "I stayed up late the day I got the book [DISSENTING VIEWS]. I just had to finish it...I do hope it reaches a wide audience." "Green discusses a broad range of literature and film, from nonfiction works to novels. He places Star Wars next to Key Largo and Saturday Night Fever to demonstrate the way Hollywood has molded our image in the minds of people around the world. He talks about Chinua Achebe's novel about colonialism in Africa, Things Fall Apart, in the same breath with The Autobiography of Malcolm X, and then he shows how they are related to Joseph Conrad's Heart of Darkness and the philosophy of Immanuel Kant." "Joseph Green produces several rather cool bookzines (zinebooks?) about the assassinations. Check them out! "DISSENTING VIEWS II is a riveting, enjoyable, and well-written collection of essays and writings on a plethora of historical topics from the JFK assassination to Malcolm X to Osama Bin Laden...and a whole lot more...Highly recommended- get this one as soon as possible!" "...Green appears just as eager to pick apart a weak argument from within the conspiracy community as one from without. In fact, the only overarching principle the author will rise to defend time and again is one that most would be forced to agree with: that it is natural for those of a level of wealth and political influence to seek to cooperate to protect their privileged status. What more is a conspiracy, after all? Reading Green is a treat for independent thinkers who may have forgotten for a spell that it really is the rest of the world that’s crazy." "Joe Green does an amazing job in this book. It is obvious that the information was gathered through much research. As another author of books about the Nov. 1963 coup I applaud him." Also available as a download is THE OPEN ASSASSINATION OF FRED HAMPTON, about the Chicago Black Panther's slaying by the local police and FBI. Released on May 29, 2017 (JFK's 100th birthday) Ratical.org began hosting a newly hyperlinked and edited version of Vince Salandria's classic FALSE MYSTERY. Dave Ratcliffe did all the heavy lifting and deserves enormous credit for making this available for free to the general public. I merely designed the cover and did some background material for a couple of footnotes. I am honored to have been involved at all in this production, and remain a warm friend and fan of both Vince and Dave. On April 19, 2015, the film KING KILL 63 made its world premiere at the DALLAS INTERNATIONAL FILM FESTIVAL! We could not have wished for a more perfect venue than the Texas Theater. 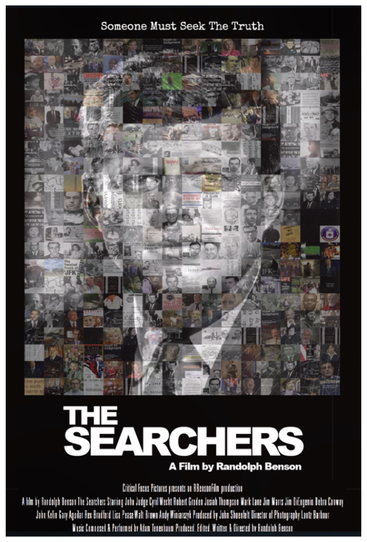 On July 4, 2017, Randy Benson's documentary THE SEARCHERS, which premiered last year at the Texas Theatre, became available to stream on Amazon and Vimeo! I served as a research consultant on the film. An interview I did with Randy on the Hidden History Center website. An article I wrote on the film for Jim DiEugenio's website.